Cleanse twice a day and remove every trace of makeup. Skincare should not make your skin sting or tingle, if it does this is likely to be a sign of irritation. Don’t fall for the marketing hype. You have to be in it for the long haul and maintain your routine, miracles do not happen overnight. 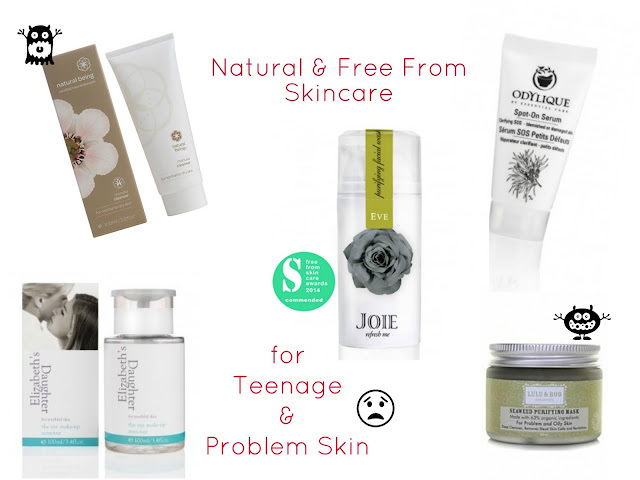 Digging into the archives I did write a post in 2011 (click here) in which I mentioned four free from brands aimed at teens - Amie Skincare, Young & Pure, Oy! and Good Things. These brands are still available but let me point you in the direction of some new suggestions. Whilst my focus today has been teenagers, don't shy away from this list of brands if you are older with problematic skin, there are some suggestions for you as well. Adam & Eve Skincare - a British brand which I first encountered at last year’s Free From Skincare Awards. This brand offers a cruelty free (Leaping Bunny trademark) range for problem skin. Conscious Skincare - the Neutralize range caters for oil/problem skin as I have experience of testing the Gentle line I am more than happy to recommend this brand. Elizabeth's Daughter - I first discovered this range in 2012 when I reviewed the Intensive Moisturiser. Products have been created for "youthful and sensitive skins" and the focus is "everyday practical needs and perfect for all teenagers!" Lulu & Boo - I have always been a fan of this brand and they have four products in their problem skin/teenage category. Living Nature’s Natural Being - When I started my “green journey” I was using products from this range and enjoyed them. Manuka honey and manuka oil have healing properties which makes them ideal ingredients for problem skin. Odylique - you all know I love this brand so they have to get a mention. The lemon & tea tree purifying wash and Spot On serum are suitable for teens or those with combination, oily or spot-prone skin. Problem skin is the opposite of my own but I do get readers looking for recommendations so I hope this list has been helpful. Let me know if you have tried these brands/products or if you have any other recommendations. So many brand introductions! I have combination, acneic skin and have yet to have any major concerns about wrinkles, just prevention. It's nice to see that the green beauty has options for people of all ages. At 24 I still have what could be described at teenage skin. Back when I was a teenager my mum would buy me loads of cheap face wash (such as Clean & Clear) which made it worse. I did my own research and discovered gentle products are much better, but she never believed me lol! When I moved out and had my own income I began buying higher quality products with more natural ingredients it did so many wonders for me skin! I have problem skin that flares up every so often so I've saved this post - very useful, thanks Sarah!! I haven't tested any brands mentioned in this post yet, but would love to. I am currently testing out Daily Detox Cream (with Palmarosa & Tea Tree) from Bloom Remedies and it's fantastic. It definitely helps to improve my skin and since I've been using it I get less breakouts. I am currently trying to find the best summer facial moisturizer for combination and problem skin and have bought quite few samples for this reason. I am yet to test Rebalancing Day Cream from Pai, Nourish Balance Essential Moisturiser and Dr. Hauschka Melissa Day Cream. I will write about all these products on my blog at some point. Salcura antiac cleansing gel is my holly grail! I'm sure even normal skins would love it, especially in summer. I massage it on my dry skin and then wash off.